When talking about important figures from the history of your football club it seems the word ‘Legend’ is thrown around far too easily. I’m guilty of it myself when talking about past players or managers from Swindon’s history, but I’m sure no-one would disagree that on Sunday Swindon Town said goodbye to a true legend in Danny Williams. I first started attending Town games in the mid-nineties, a full 10 years after Williams left SN1 for the second time, so I can’t talk about how brilliant his teams were from first hand experience. Like many Town fans my knowledge of Danny Williams and what he achieved in Wiltshire is from the history books and talking to fans that enjoyed watching his Swindon sides over many years. Looking at the list of influential players he signed is astounding, Joe Butler, Peter Downsborough, Stan Harland, Willie Penman, Don Heath, Peter Noble, John Smith, Frank Burrows and Arthur Horsfield. All these players etched themselves into Swindon Town folklore during and after his time at the club. To any other football fan March 15th 1969 is like any other day but for anyone connected to Swindon Town, thanks to Danny Williams and his talented side, it’s the most famous day in the history of our club. For someone like myself who missed out on a lot of the clubs major successes over the years, it blows my mind to think my football club could take on a club the size of Arsenal in a major final in front of 98,189 fans and come away the winners, but that’s what Danny Williams achieved. As the 50th anniversary of the clubs most famous day comes around I’m sure the man who led them there won’t be far from people’s minds. It was encouraging to see current manager Richie Wellens pull off some good signings on transfer deadline day. As we witnessed Kyle Bennett, Theo Robinson and Cameron McGlip all sign on the dotted line at SN1 last week. 28-year-old Kyle Bennett has enjoyed a couple of promotions in his career with Doncaster and Portsmouth, so brings vital experience with him. Town fans will be expecting a lot from the new winger as I predict he will become a key man in Wellens’ side moving forward. Striker Theo Robinson arrives on loan from Southend and will hopefully add the goalscoring touch to this Town side, which it’s currently missing. It’s interesting to see the former Watford man at the County Ground after he came very close to joining Swindon nearly a decade ago, but then Chairman Andrew Fitton couldn’t quite sort out a deal with the player’s agent, meaning he signed for Huddersfield Town instead. I imagine both players should fit straight into the manager’s starting eleven after having the opportunity to train for a full week with their new teammates, let’s hope they can make the difference alongside the other new faces in the Town squad as they travel to the soulless Stadium MK this Saturday to face Milton Keynes FC. 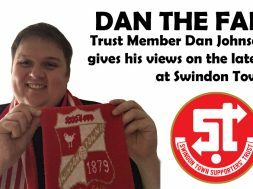 previous DAN THE FAN – Can Town overcome their inconsistent form?